"41AN26 - 91" by Timothy K. Perttula and Robert Z. Selden Jr.
DECORATION (INCLUDING MOTIF AND ELEMENTS WHEN APPARENT): The rim panel is defined by single upper and lower horizontal engraved lines with either upwards- or downwards-pointing excised tick marks. The panel is also divided into 10 sections by sets of excised vertical lines. 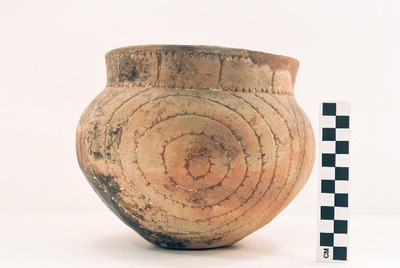 The vessel body has three repeating sets of concentric circles and semi-circles with outward-pointing excised tick marks. These sets of concentric circles and semi-circles are divided at their upper end by large open pendant triangles with a short spur line from the apex of each triangle. Patton Engraved, var. Freeman globular bowl from the Richard Patton site.